Home > Children>Kid's handles>Kid's Handle Square 70 mm. Kid's Handle Square 70 mm. Wooden handle for kid's room, lacquered in square shape, measurement 70 x 25 mm. diameter with inlaid nut for bolt, this price includes the bolt. Available in 3 colors, pink, blue, and white. Kid's Handle Ball w/white Polka Dots 40 mm. Kid's handles hand-painted ball shaped measurement 40 mm diameter with inlaid nut for bolt, this price includes the bolt. They are white and are available in 4 colours pink polka dots, blue polka dots, beige polka dots and grey polka dots. Kid's Handle White Ball w/Polka Dots 40 mm. Kid's Handle White 50 mm. Wooden handles for kid's room, different shapes and white lacquered, measurement 50 mm. diameter with inlaid nut for bolt, this price includes the bolt. Tiradores infantiles Beige 5 cm. Tiradores infantiles Gris 5 cm. Wooden handles for kid's room, available in different shapes and not painted, measurement 50 mm. diameter and the Bear's face and Star 60 mm. inlaid nut for bolt, this price includes the bolt. Kid's Handle Cream 70 mm. Wooden handles for kid's room, lacquered in Cream color, measurement 70 x 25 mm. diameter with inlaid nut for bolt, this price includes the bolt. Available in 4 shapes, Star, Bear, Square and Circle. Kid's Handle Grey 70 mm. Wooden handles for kid's room, lacquered in grey color, measurement 70 x 25 mm. diameter with inlaid nut for bolt, this price includes the bolt. Available in 4 shapes, Star, Bear, Square and Circle. Kid's handle Round 70 mm. Wooden handles for kid's room, lacquered in round shape , measurement 70 x 25 mm. diameter with inlaid nut for bolt, this price includes the bolt. Available in 3 colors, pink, blue, and white. Child Star Shooters 80 mm. Children wooden handles with star shape measure 80 mm. with countersunk screw nut, this price includes the screw. Available in 3 colors pink, blue and wood. Kid's Handle Star 70 mm. Wooden handle for kid's room, lacquered in star shape, measurement 70 x 25 mm. diameter with inlaid nut for bolt, this price includes the bolt. Available in 3 colors, pink, blue, and white. 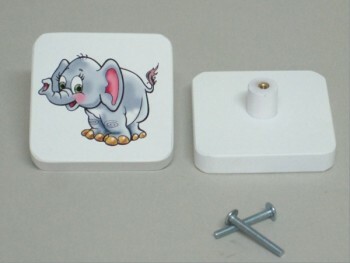 Wooden handle for kid's room, lacquered in square shape and an elephant drawn, measurement 70 x 25 mm. diameter with inlaid nut for bolt, this price includes the bolt. Vinieron perfectos. Igual que en la fotografía. Kid's Handle Square 70 mm. has a rating of 10 out of 10 based on 1 customer reviews.